Stocks rebound as news the Fed was considering a more aggressive course of action counters a weak read on consumer confidence. Chao Deng recaps the action. NEW YORK ( TheStreet) -- Stocks rallied for a third straight day Tuesday as news the Federal Reserve considered a more aggressive course of action at its last meeting countered a weak read on consumer confidence. The Dow Jones Industrial Average finished up 21 points, or 0.2%, at 11,560. 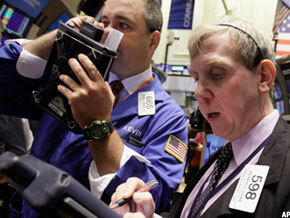 The S&P 500 rose 3 points, or 0.2%, to close at 1213, and the Nasdaq gained 14 points, or 0.6%, to settle at 2576. Despite the gain, market watchers were skeptical the major U.S. equity indices would continue to build on the recent rally. "For now, the market looks to battle around these levels," says Jeff Sciscillo, strategist at Campbell Wealth Management. "By being oversold in the near term, the market could bounce but remain in an overall downtrend," said Sam Stovall, investment strategist with Standard & Poor's. "Investors remain worried about a potential recession in the U.S. and sovereign debt worries in Europe. However, the purchasing of Spanish and Italian debt by the European Central Bank and the International Monetary Fund has helped quell investor concerns," he added. Earlier in the session, the Dow shaved off some 40 points on news that confidence among consumers plunged to its lowest level since April 2009. The index dropped to a reading of 44.5 in August from 59.2 in July, according to the Conference Board. Economists had been looking for a reading of 52. In the last two trading sessions, the Dow has surged about 360 points after a speech from Federal Reserve chief Ben Bernanke on Friday left the door open for the central bank to consider further stimulus measures come September. The blue-chip index has seen two rounds of rallying since Aug. 10, a few days after credit rating agency Standard & Poor's downgraded the U.S. credit rating for the first time in history, prompting a drop down to 10,720 on Aug. 8. Recent rallies have been on low volume, as was the case on Tuesday. Some 4 billion shares changed hands on the New York Stock Exchange, while 1.8 billion traded on the Nasdaq. About 60% of NYSE shares advanced while less than 40% declined. "It's possible that in September, October or November, the market will reach a new bottom," said Paul Nolte, managing director of investment firm Dearborn Partners. "The decline might be slower but still stands a chance of scaring investors." In the U.S., investors are looking ahead to the government's highly anticipated monthly job report on Friday. Economists are expecting some 100,000 jobs added in August after gains of 117,000 in July. Briefing.com is expecting the unemployment rate to tick up to 9.2% from 9.1% in July. Meanwhile home prices showed signs of life, rising 1.1% year-over-year in June and increasing 3.6% for the second quarter after falling 4.1% in the first quarter. The release of the minutes from Federal Open Market Committee's Aug. 9 meeting showed deep divisions between Fed members on the appropriate action the central bank should take to help the economy. The members disagreed on whether inflation would ease or creep up and whether the government's projection of U.S. economic growth was too optimistic. Trading on the Dow was weighted toward the negative, with more than half of the components slipping into the red. Financial stocks Bank of America ( BACand JPMorgan Chase ( JPM traded at the bottom, while Caterpillar ( CAT, Boeing ( BA and Microsoft ( MSFT traded at the top. In corporate news, Barnes & Noble ( BKSshares soared 15% after the bookseller reported strong sales of its Nook digital e-reader. Barnes & Noble posted a wider than anticipated loss of 99 cents a share in the three months ended July 30, compared to analysts' estimates for a loss of 94 cents a share. But revenue from Nook business surged 140% year-over-year. Starbucks ( SBUX said Tuesday that K-Cup portion packs of its coffees for the Keurig brewing system manufactured by Green Mountain Coffee Roasters ( GMCR will be available for retail sale in the United States in November. Starbucks and Green Mountain Coffee Roasters reached a licensing agreement back in March for Starbucks to be the "exclusive licensed super-premium coffee brand" for Keurig system. Shares of Starbucks rose 1.2% at $38.50 while Green Mountain shares advanced 4.3% to $103. Jacksonville, Fla.-based supermarket operator Winn-Dixie Stores ( WINN forecasted adjusted earnings before interest, taxes, depreciation and amortization of $120 million to $135 million with same-store sales seen rising 2.5% to 3.5% for fiscal 2012 after topping Wall Street's profit expectations for its fiscal fourth-quarter results as same-store sales rose 3.2%. Shares dipped 2% to $7.45. Discount retailer Dollar General ( DG reported second-quarter adjusted earnings 52 cents a share, compared with the average analyst expectation of 48 cents a share. Shares gained 5.8% to $35.76. The October crude oil contract gained $1.63 to settle at $88.90 a barrel. Elsewhere in commodity markets, gold for December delivery closed up $38 to trade at $1,830 an ounce. The benchmark 10-year Treasury was gaining 20/32, diluting the yield to 2.19%. The dollar weakened against a basket of currencies, with the dollar index up by 0.6%. European markets closed mixed with the FTSE in London ending up 2.7% and the DAX in Frankfurt slipping 0.4%. Hong Kong's Hang Seng rose 1.7% while Japan's Nikkei added 1.2%. --Written by Chao Deng in New York.